With the 2018 draft in the books and not an early round QB selected, I'm left to wonder... Who will be the QB of the future? Is Danny Etling a sleeper that we plucked late in the draft, who ends up being a great starter in 3 years? (Not that you could say that right now...). What are our best options starting next year? What does everyone think? Anyone that I didn't mention? Who's the best? Some of the national outlets are starting to connect thorson and the patriots. Finley is missing. Looks like PT QB . but he'll have a lot of proving to do that he is not scared of winning. Some were snubbing 2018 class but this one starts like leftover w top guys returning to avoid strong competition and underclassmen w everything yet to display . Still full season to play but starting point looks to be significantly lower than last year and counting on franchise QB not realistic at the moment. On the other hand it is very likely that top 4 QBs won't go in top 10, possibly not even in 1st round so the value of potential might ultimately be better. Sorry for unenthusiastic start here but I wouldn't be surprised to see BB active in QB FA next year (or even sooner).. There certainly are things to like about some guys and it will be interesting to monitor their development..
i did like how Grier “sits“ in games..
Good call on Finley. I had a brain fart when I was making the list. Finley was my favorite QB prospect around midseason last year, but then I started to see some of his faults. He seems to have below average arm strength, and he's too willing to checkdown instead of look for more productive, harder throws down the field. You obviously don't want your QB to force it, but you want a guy that will win you games, instead of merely 'not lose' them. If your entire offense is centered around not losing, you better have a top 3 defense come playoff time. I do think he has the ability to progress though, so I'm excited to see what he does this year. I'm actually higher on this class than the past one. I really had a dislike for the big names in the class from day one. I think Sam Darnold is pretty overrated, for instance. You're right though... if some of these guys are lesser touted, it's really to our advantage. Let's get another Jimmy G in the late first or early second. What do you mean Grier sits? Justin Herbert looks like Football Jesus when healthy. Effortless, compact delivery with a cannon for an arm. Accurate. Finds guys downfield. Steps up in the pocket when necessary. Adjusts his arm angle when beneficial. Oh, and he runs like a gazelle in the open field, and at 6'6" 235, that's awfully impressive. Hopefully Oregon doesn't kill him this year in that stupid spread option offense. Lock has bad mechanics and plays in a terrible offense for teaching pro style QBing. Thorson, on the other hand, has great mechanics and a lot of great physical traits, but he's inaccurate at times and plays too tensely. Patterson is being hyped hard as the next mobile, short wunderkind QB, but I see more flash than substance. All of Grier's throws are floats. Not impressed with the quality of his throws. Stidham plays in a crap offense, but he looks good when he does make pro throws. At the moment for me, it's Herbert and Stidham at the top, and then everyone else. He is the opposite of Finley. Uninhibited. Lets the plays/game come to him. Surfer (surfs with the flow of the game). Smooth operator. Confident boxer dancing in the ring. Jazz player. To me two things are important w QBs: not being scared of winning and not being scared of losing. Not shying away from tight windows and not forcing stuff etc.. Its a mental state. Not sure if BB would like his character but he's best watch. btw - don't see too much of a floating problem really. this is VT game so going against some serious defence with 2 1st rounders . the end decision is not the best one but his surf is there and same from 1st to last minute despite being the start of the season. He improved throughout the season and improved his teammates. And look at his red zone play any time..
Ok, went back and looked at Herbert and Stidham more, along with a few others. Herbert and Stidham play in offenses that limit their reads, and when the pressure is on, both of them seem to wilt. They have physical tools but as of yet have not displayed the ability to pick a defense apart with their passing ability. Grier looks solid, @long distance. I will say he could pull it off in the NFL, although I wouldn't expect him to be a high-end starter. He'd be a guy sort of like Case Keenum that survives on guts, accuracy, and decision making. And also, Ryan Finley does indeed look very solid too. I mentioned earlier that he was Captain Checkdown. Lots of people have said it. However, when I watched his bowl game, I saw a more confident player who was making better downfield throws. He's definitely in the mold of what you want, although I still wonder about his ceiling. In re-review of the best options, I come back to a couple underclassmen that don't have a great chance of declaring. Feleipe Franks and KJ Costello seem to be the best pro style QBs in college football today. I'm not even sure if they would be ready by the end of next year. However, unlike everyone else mentioned, I see moxie, intelligence, and pass-making ability in these guys. Also, as an aside, it's kind of sad to see how much the spread option offense has proliferated college football and how dumbed down these offenses have become for the QBs that are coming up. They just don't even get a chance to learn anymore. There's not really a thread for general Xs-and-Os stuff like this. So, I'll use the excuse that this is the kind of thing that a "QB of the Future" will need to learn upon arriving in the NFL. Good tweet thread. Worth the time. We definitely need an X's and O's thread. Good post. For what it's worth, the Patriots are one of only a handful of NFL teams that use a particular offensive playcall terminology that descends from the Parcells/Belichick coaching tree. And with that being said, the Patriots are the only team to my knowledge that uses all of the kinks and tricks in the NE playbook, namely the pass route complexity. I don't know if that extends to pass protection schemes or not. I have to guess that the protection scheme calls contribute to the pass route package complexity. The "70 Series" protections discussed in the tweet thread appear to set the starting positions of at least some of the potential passing targets for the route package of that particular play (RBs and TE, included). The "Terry" and "Tally" pre-snap blitz protection adjustment calls that keep the TE in to block would seem, of necessity, to affect the route package overall, and likely the coverage sight adjustments of the remaining pass-targets. The playcall terminology derives from the concept of "route package" itself, IIRC. The basic premise, as I understand it, is that instead of the QB calling something like "X-7, Z-9-8, Y-hiphop-4, bogie-smash-6, circle-1-zag, drift Lackawanna on two" for the route package, the whole thing (plus specific sight-read adjustments) is incorporated into some term like "Ruby Tuesday". Pre-snap adjustments may be single-word like "Terry" or "Tally", and a shift into an alternate package or to/from a run-play might be signaled by calling out something like "Omaha". Obviously, this requires a metric-crap-tonne of memorization for everyone on the field and, in the past, receivers who had played their entire careers under the first type of play-calling system often had extreme difficulty adjusting to the package-concept system (Ochocinco's problem, I'd bet). Nowadays, most teams (including most college teams) are using some form of package system terminology, so the adjustment is mostly learning a new vocabulary for familiar packages and then the nuances of the differences in the packages themselves. Still not easy, even in the absence of the conceptual hurdle, since I'd guess that the Pats playbook has many more packages and more nuances in each package, especially when it comes to pre-determined pre-and-post-snap sight adjustments. I know that the Colts and the Broncos, under Peyton Manning at least, used "levels" concepts in their route packages, and that the Saints also do so with Brees. Other teams likely do, as well. 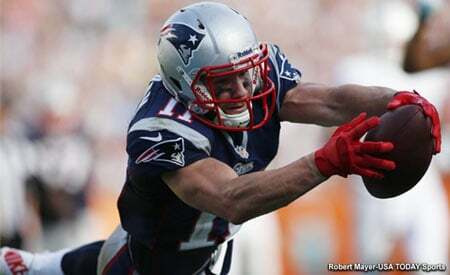 Many teams also require at least some pre-snap/post snap sight adjustments from their pass-catchers. As far as other teams integrating all these things to the extreme that the Pats offense does, yeah, probably not. The ability to effectively implement such complexity depends on the mental "sophistication" and creativity of not only the QB, but also the pass-catchers the position coaches and the OC. One of the notes that Warren Sharp had on the Jags' 2017 offense was that there were certain packages (and "disguised" versions thereof) that Bortles and his pass-catchers executed extremely well and successfully, but they were limited in number and, later in games, they'd often begin repeating them (without variation or "tweaks") out of necessity (probably due to Bortles' limitations as a QB). He noted that smart defenses that had the ability to adjust would pick up on this and often shut down the Jags offense in Q4 (e.g., the Pats in the AFCCG). OTOH, one of the criticisms of the Colts' offense in recent years was the lack of play-calling creativity by OC Rob Chudzinski, especially later in games when they'd fall into easily-predictable patterns. It might not be unreasonable to think that the OC's game-planning and play-calling has been the limiting factor there, as opposed to Luck, or even Brissett, being able to handle something more sophisticated and complex. It'll be interesting to see what happens in 2018 with Frank Reich as the new HC and Nick Sirianni as the new OC - plus a lot of interesting, young skill position players and (at last) some real effort invested in upgrading their OL. Keep in mind that Reich was the Eagles' OC in 2016-17 and, in the Superbowl, they never ran out of plays that kept the Pats guessing. Nasty rumor going around that Hebert was crying in the huddle during a bad game or practice. Not sure that is demonstrating the maturity to lead the huddle. Just after the draft, I made this post on another forum. You might enjoy it. I've been reading up on the Patriots offensive scheme today, and I learned something very interesting. Guys like Braxton Berrios are essentially Julio Jones in that system, and I'll explain why. It's such a different system from the rest of the NFL that most people don't understand how someone who's not tall or incredibly fast is the ultimate 'matchup nightmare'. A lot of people talk about setting up the run with the pass (or vice versa). Well, there's also setting up the pass with the pass. By that, I mean affecting the defense in such a way to make them give you one coverage, and then you throw it to the guy that can best beat that coverage. In plainer English, you can develop a passing scheme that is designed to destroy zone defense. Then, when the defense gives up and is playing man, you've now set up the second part of your passing gameplan. This also works vice versa -- some passing attacks are more geared towards destroying a man defense. So, one quick bit of background that I have to get out of the way. When people talk about the WCO, the Coryell or digit system, and the Erhardt Perkins (the three primary offensive systems in the NFL), they are strictly talking about the playcalling systems. Each playbook is written in one of these three languages. You'd be naive, however, to think that you run all of the exact same plays in different systems, except you call them different things. The different languages have their strengths and weaknesses, and the complexity of the playcalls center around that linguistic base. The WCO and the Coryell system use words and numbers (respectively) to describe individual routes. When you had 2 WRs and a TE, these were effective. The Coryell system had the additional benefit of being easier for a WR to play anywhere on the field. If he knew the route tree and the formation, he was basically good to go. As offenses have gotten more complex and more spread out (e.g. 3 WRs or more), these languages are more poorly adapted to describe plays. That is why you hear the horrors of the 15 word playcalls in the WCO. The Erhardt Perkins offense uses words to describe groups of routes. They're concepts. Like the Coryell (except different, because we're talking about concepts that a receiver has to fit, not a particular route number from the route tree), they do make it very easy to run a single play from an infinite number of formations. All you have to know is the concept being ran and which receiver you are (the 1st, 2nd, or 3rd from the outside on a given side of the field). Also, crucially, on every single play, each receiver has basically three different routes that they could run. If they read man coverage, there's a route for that. If it's a certain type of zone, there's a route for that. If the defense is lined up a certain way (off, inside shade, close, etc), there's a route for that. You can apply option routes to the other playcalling languages, but it's more complex and difficult to do so. The Erhardt Perkins makes certain things simple to allow other things to be complex. The WCO and Coryell use their finite amount of complexity in different areas, and they just don't have the currency to be complex here. Ok, so this E-P offense is essentially designed from the ground up to obliterate zone coverage. I'm going to contrast that with the WCO and the Coryell, which were formed at a time when man coverage was more of a thing. Or, maybe I should say, zone defense was not nearly what it is today. The WCO and Coryell have very tight throwing windows in zone, so there's great stress placed on the timing components of these routes. If you perfect this, so the theory goes, the defense will give up trying to play zone, and they will go to man. At this point, you have your Jerry Rices, your Terrell Owenses, your Julio Joneses (aka the cliche "#1 WR"), and you shred the defense because nobody covers those guys 1-on-1 consistently. What else makes them great though? You give them a limited number of routes to run, and the defense *still* can't stop them. It's like having a workhorse running back that no one can tackle, no matter what the playcall is. Hopefully I'm not being pedantic here when I say the E-P does the complete opposite. You have this complex set of reads that the WRs and QB make on every play, so you have to pick personnel that can fit that scheme. Chances are, you aren't getting a lot of the best athletes because great athleticism and intelligence often don't go hand in hand (and I'm not necessarily talking potential here... it's just practical, just like Shanahan talks about wanting pocket QBs because they grow up developing a cerebral because of their limitations). The point is that defenses want to play man against this offense, by default. Your WRs are slower, and if they make good reads, they make your coverage not just wrong by tiny throwing windows (as in the WCO and Coryell); they make your defense *way* off. Now, throw a Wes Welker in the mix. Here's a guy that is able to make these reads and be part of the zone defense attack, but he's crucially this guy that could run circles around a mongoose. He's impossible to cover man to man for a certain range of routes. Sure, you can cover him with a single man, perhaps, if he runs a streak. But what if he makes a hesitation move and cuts multiple times in his route? He's basically uncoverable. In the E-P offense, he IS the Julio Jones of the passing attack. That's why he is special, and that's why Braxton Berrios could be special. He has that same suddenness. You couldn't just take a random WR who's great in another system due to his athleticism and think that the Patriots system would give him even better results. If he can't handle the reads on the option routes, he's not much use to the offense. But if he can handle those reads, then any single physical advantage that he has versus a defender in man coverage is more exploitable in the E-P than in any other system, because they can very simply call very complex routes. The WCO needs a name for each route, not to mention a 15 word play call to put it all together and huge attention to the timing portion of the offense, to keep everything together. The Coryell needs a number, and there are only 10 single digits. This doesn't just go for small jitterbug receivers. Anything that creates a mismatch is usable. What they actually do, if they read man, is isolate their two or three best mismatches while drawing coverage away with the rest. You might have a Wes Welker doing his thing on one side. On the other, you might have a RB on a LB, or you might have a TE on a LB or S or CB. Gronk is their size mismatch. If you've forced the defense into man, which they probably don't want to do if they're facing Gronk, you know have a Power Forward going anywhere he wants to beat a woeful Point Guard who's trying to not get boxed out. If you look at the consistency of Tom Brady, not only over the years but also game to game, you can see how this attack is simply impossible to stop with the right pieces in place. And it doesn't require Julio Joneses to make it work. Their star receiver was just taken in the 5th round. Gronk was technically a 2nd rounder, but still, we're not talking about elite talents that only come around every 10 years and always go in the top 10 of the draft. This levels the playing field in terms of talent acquisition. This is a big advantage over the long haul. Not a pretty picture of Jake Bentley.. I appreciate the link, but I have to disagree with the conclusions to some degree. The Pats offense has not significantly suffered without Welker, so it was clearly about more than him. That's from 2009. At that point, I don't think there was another Welker, and Edelman was just a rookie. One thing that will go against Herbert is that he plays in as you said in Oregon Offensive system..
Everybody wrote off Matt Cassel as a lost cause in 2008. . . .